Before you make any further plans for your office Christmas party, you need to have a set budget. In order to define an accurate budget, figure out the number of employees attending the party, and work out an affordable price per head. The overall cost will take up a large portion of your budget and affect other decisions such as venue hire, entertainment, and your bar tab. Once your budget is set, you can start to look for appropriate venues as well as interview potential caterers. Your workplace Christmas party isn’t just about celebrating the holidays: it’s also a way to communicate your appreciation of your employees. Be generous with your budget, but be sure that you adhere to it. You might be considering holding your office Christmas party on your company’s property: this could save you money and be far easier to organise. However, if you hold your Christmas party offsite, you’ll find that hiring a professional venue can be economical and far simpler to organise. It also takes you and your employees of the office premises: allow your employees to relax in a new, fresh, festive space, away from the work place. Your employees will enjoy the opportunity to socialise outside of the office environment. There are a few important things to keep in mind when you’re choosing a venue for your Christmas party. Your venue should be centrally located, so that it’s easy for all of your employees to travel to. You should also look for a venue that provides enough parking for you and all of your guests. If you want to add an extra touch of class, you could even look for a venue with valet parking. The theme of your event will determine the type of venue that you choose. If you’re looking to hold a classical, sophisticated Christmas dinner, look for a banquet hall or function room at a local venue. These professionally hired venues should offer you a range of different sized rooms for your party: you can select a space that best suits your budget and the length of your guest list. The other advantage of hiring a banquet hall or function room is that the venue hire company usually supplies you with décor, tables, chairs, and tableware. 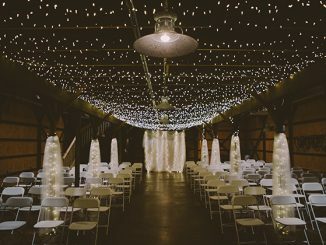 A professional venue hire company will also offer you the convenience of having their staff decorate the space in order to create a suitably festive atmosphere. If you’re looking for something more relaxed, and if you’re catering for a relatively small crowd, you could hold your Christmas party in a picturesque park by the ocean; in flourishing botanical gardens; or a similar outdoor space. If you choose to hold your party outdoors, you may have to hire out your own equipment and decorations for the space. 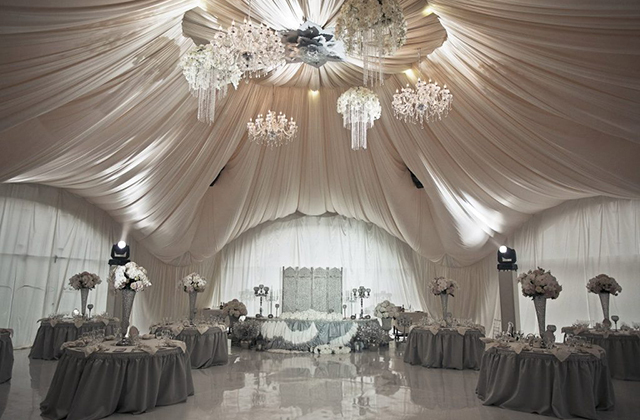 Search around: some venue hire companies will have outdoor spaces available to you. Once you’ve found the ideal venue for your office Christmas party, you can start searching for an appropriate caterer. Some venues will have their own on-site catering service, but you could also look for a preferred catering company. Deciding on a caterer for your Christmas party will depend on a number of points: the flexibility of your budget, the type of food you’d like to serve, and the theme of your occasion. 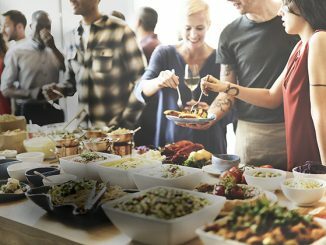 A good catering company will be able to offer you a range of different choices, as well as offer you a number of different types of service: from a seated meal to a cocktail menu; from food stations to a buffet. 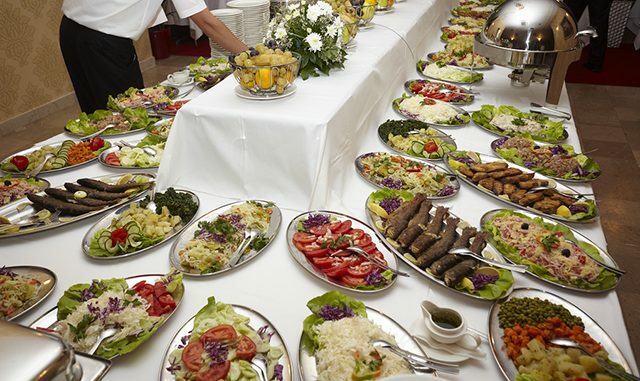 A professional catering service will also be able to provide for any dietary requirements that your guests may have. Before you meet with your caterer, it’s important that you have a list of your guests’ dietary requirements; whether they’re allergic to foods, on a strict diet such as veganism, or if they have any religious dietary restrictions. Discuss these requirements with your caterer to see just what they can provide for you. You should also speak to your caterer about refreshments for your guests. 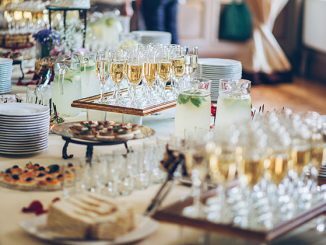 If your budget permits, you could provide an open bar for your guests: but be sure to ask your caterer, and the venue staff, if they have a license for the service of alcohol. In Queensland for example, it’s illegal to serve alcohol without a Responsible Service of Alcohol license. Your caterer will need a copy of your guest list in order to know how much food to order, and how many staff to employ for service at your Christmas party. You want your evening to be enjoyable, festive, and without complication: there’s nothing worse than running out of food or receiving poor service due to insufficient staff. Ensure that your caterer or your venue hire service can provide you with waiters and waitresses, bartenders, and cleaning staff. An office Christmas party is a simple, thoughtful way to thank your employees for the work they’ve done in the past year. It also provides you and your employees with the opportunity to enjoy one another’s company outside of the workplace. With some careful planning, the right venue, and the right catering service, you can pull of a Christmas party that your employees will be talking about until the next party. 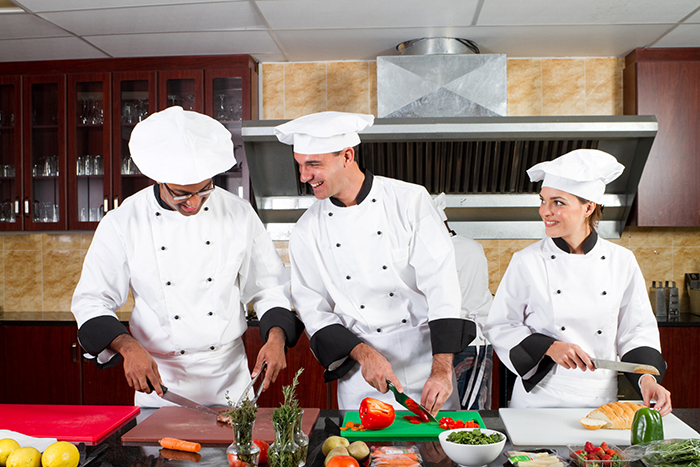 Pure Catering Brisbane organise catering in Brisbane, Sunshine Coast and across the whole of South East Queensland. 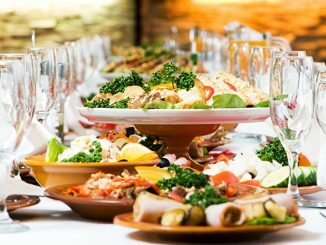 With modern menus, the best customer service and an exceptional eye for detail, Pure Catering Brisbane has established a reputation as one of the best caterers in the region. Pure Catering Brisbane & the Catering Sunshine Coast pride ourselves on trying to be as ethical as possible without inflating the price. We source our ingredients from local Brisbane, Sunshine Coast and Australian suppliers. All of our meat is free range and we use local shops wherever and whenever we can.